ABERDEEN PROVING GROUND, MD. (April 17, 2018) – Engineers at the U.S. Army Research Laboratory and the University of Maryland have developed a technique that causes a composite material to become stiffer and stronger on-demand when exposed to ultraviolet light. This on-demand control of composite behavior could enable a variety of new capabilities for future Army rotorcraft design, performance and maintenance. ARL's Dr. Frank Gardea, a research engineer, said the focus of the research was on controlling how molecules interact with each other. He said the aim was to "have them interact in such a way that changes at a small size, or nanoscale, could lead to observed changes at a larger size, or macroscale." Dr. Bryan Glaz, chief scientist of ARL's Vehicle Technology Directorate said "an important motivation for this work is the desire to engineer new structures, starting from the nanoscale, to enable advanced rotorcraft concepts that have been proposed in the past, but were infeasible due to limitations in current composites. One of the most important capabilities envisioned by these concepts is a significantly reduced maintenance burden due to compromises we make to fly at high speeds, he said. The reduced scheduled maintenance of future Army aviation platforms is an important technological driver for future operating concepts. "The enhanced mechanical properties with potentially low weight penalties, enabled by the new technique, could lead to nanocomposite based structures that would enable rotorcraft concepts that we cannot build today," Glaz said. The joint work, recently published in Advanced Materials Interfaces (DOI: 10.1002/admi.201800038), shows that these composite materials could become 93-percent stiffer and 35-percent stronger after a five minute exposure to ultraviolet light. The technique consists of attaching ultraviolet light reactive molecules to reinforcing agents like carbon nanotubes. These reactive reinforcing agents are then embedded in a polymer. Upon ultraviolet light exposure, a chemical reaction occurs such that the interaction between the reinforcing agents and the polymer increases, thus making the material stiffer and stronger. The researchers said the chemistry used here is generally applicable to a variety of reinforcement/polymer combinations thereby expanding the utility of this control method to a wide range of material systems. "This research shows that it is possible to control the overall material property of these nanocomposites through molecular engineering at the interface between the composite components. This is not only important for fundamental science but also for the optimization of structural component response," said Dr. Zhongjie Huang, a postdoctoral research fellow at the University of Maryland. Army researchers conceived of this fundamental approach for the potential of "enabling new leap-ahead capabilities in support of the Future Vertical Lift Army Modernization Priority," officials said. "In this instance, the development of advanced structures to enable leap-ahead Army aviation capabilities not currently feasible due to limitations in mechanical properties of current materials," Glaz said. "This is especially important for the envisioned future operating environment which will require extended periods of operation without the opportunity to return to stationary bases for maintenance." Some particularly attractive design options that correspond to lower mechanical loads and vibration are not currently achievable due to limitations in structural damping in hingeless blade or wing structures. Future structures based on this work may help lead to new composites with controlled structural damping and low weight that could enable low maintenance, high speed rotorcraft concepts that are currently not feasible (e.g. soft in-plane tiltrotors). In addition, controllable mechanical response will allow for the development of adaptive aerospace structures that could potentially accommodate mechanical loading conditions. 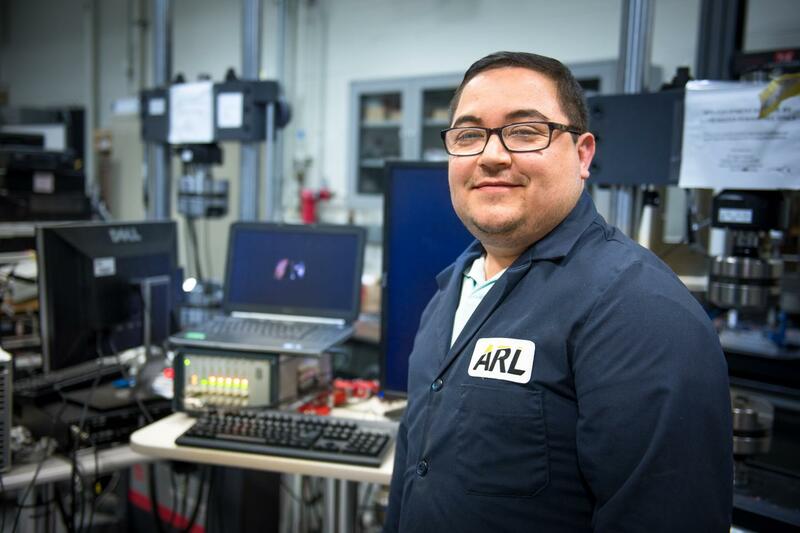 "The Army Research Laboratory and its partners will continue to invest in emerging and Soldier-inspired technologies that will enable more reliable, higher performing, and leap-ahead capabilities that are key to the advancement of the next generation platforms used by Soldiers," said Elias Rigas, division chief of the ARL Vehicle Applied Research Division. Collaboration between the ARL and the University of Maryland was crucial in the development of this method. "In our lab at UMD we have been developing unique carbon nanomaterials and chemistry but it was not until Gardea approached us did we become aware of the intriguing challenge and opportunity for reconfigurable composite materials," said Dr. YuHuang Wang, professor of the Department of Chemistry and Biochemistry at the University of Maryland. "Together we have achieved something that is quite remarkable."